A possibly surprising fact: Greg Bird has already set a career high in plate appearances this season, and by quite a bit too. He’s batted 228 times this year. Last year it was 170 plate appearances — if you want to include the postseason, it was 224 total plate appearances — and back in 2015 he had 178 plate appearances. 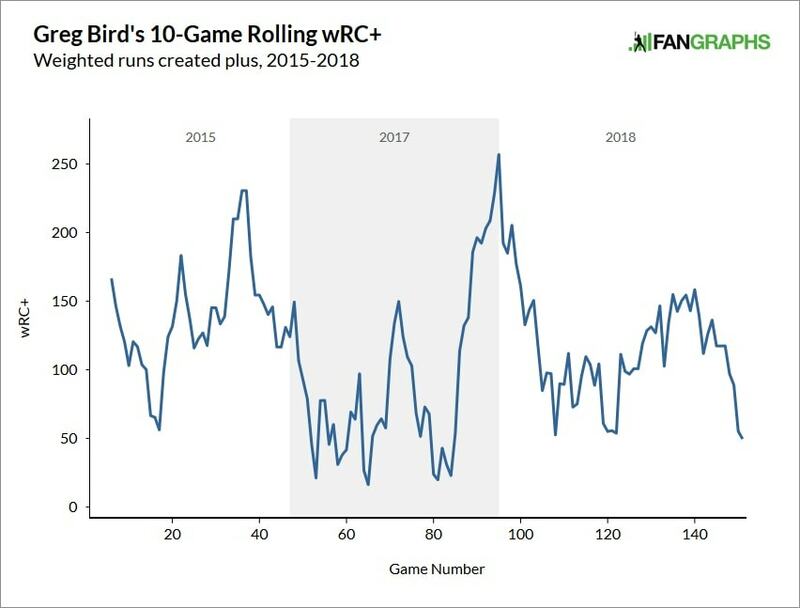 It feels like Bird just got back into the lineup, but, in reality, he’s been in the lineup more than ever this season. Bird has started bunting against the shift recently, which is great — I think he’s picked good spots for it too, there are times to push a bunt and there are time you need to swing the bat, and Bird’s bunting at the right times — and he did sock that game-tying home run against the Royals a week ago, so that’s cool. Overall though, Bird has not been an impact bat. He remains more potential than production. One thing Bird has not done since returning: Hit fastballs. Pitchers have been attacking him with fastballs, especially elevated fastballs up in the zone (or higher), since the day he arrived in the big leagues. Teams scout the minors more thoroughly than ever before. Prospects come up nowadays and the opponent already has a book on him. The book on Bird says to go after him with fastballs. Even in 2015, his most effective stint as a big leaguer, Bird was not a great fastball hitter. This year he is comfortably below average. A very low batting average — I think he’ll be a low average hitter going forward anyway as a shift friendly pull heavy left-handed batter — and only a league average isolated power rate despite being a left-handed hitter in Yankee Stadium. Eek. Of course, we don’t have huge sample sizes here. Bird only recently crossed the 200 plate appearance threshold for the first time in his big league career. He’s seen 598 fastballs this year. Not a big sample! It is a meaningful sample though. Exit velocity and contact quality stats tend to stabilize quickly, and, so far, Bird is trending the wrong way against fastballs. Look at the exit velocity and xwOBA in the table. That’s not a good direction. One one hand, yes, this could all be sample size noise and not indicative of the real Greg Bird. On the other hand, we have a hitter who was susceptible to heaters when he first broke into the league — opponents told us that with the way they attacked him — who has since had one major shoulder surgery and two ankle surgeries. That’s not nothing. His front shoulder and plant leg have been compromised. This is where I’m going to remind you that yes, Greg Bird can still hit a fastball on occasion, even really good elevated fastballs near the top of the zone with velocity. Overall though, Bird’s fastball production is sorely lacking in a league dominated by fastballs. There is more velocity in baseball right now than ever before, and I see no reason to think the league average velocity won’t continue to climb in the coming years. It seems like every pitcher who comes up from the minors sits 94-95 mph and touches 97 mph these days, even the up-and-down non-prospect guys. Bird hasn’t played much baseball the last few years — including the minors, he has 660 total plate appearances since Opening Day 2016, so one full season’s worth of plate appearances in two and two-thirds seasons — so perhaps he’s still working to get his timing all the way back, especially following his most recent surgery. It’s possible. Three surgeries to two body parts crucial to hitting mechanics in such a short period of time is no joke. Whatever the reason, Bird has not hit fastballs much this year. He didn’t hit them all that well last year either, and he’s been even worst against them this year. The Yankees love Bird. Love love love him and they’re going to stick with him. They don’t really have much of a choice at this point anyway. The Yankees love Bird, but he has a real problem with fastballs, and the injuries make it fair to wonder how long it’ll be until he can consistently handle the league’s current velocity, if ever.